Billions of people all over the world have seen the work of Mike Fulmer. He has worked as a model maker in several blockbuster films such as The Empire Strikes Back, E.T. The Extra-Terrestrial, Raiders of the Lost Ark, and Always. 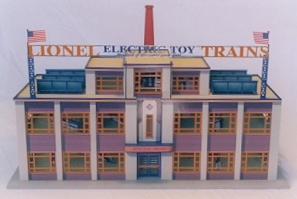 Lionel collectors were introduced to him in the Classic 1998 catalog. Most recently, a model Mr. Fulmer created for Lionel of Grand Central Terminal was sold at the Lionel Auction for $40,000. We usually interview people in the hobby on the management side of things. We thought interviewing someone on the creative side would be fun. Neil Young, the famous rock star who is part owner of Lionel, hired Fulmer to do what he does best: make models. Lionel capitalized on his skills and talent to create unique products that injected a sentimental energy to the accessory line. I was amazed looking at the photographs Mike sent of the various prototypes at how close they are to the finished products. That was not always the case, however, as evidenced by the infamous Back Shop. This was an example of a product that fell far short of its initial concept and potential. We talk about that, a few of his other contributions to Lionel, and his experiences in film production. Toy Train Revue: Did you have toy trains growing up? Did they play any role in your career as a model maker? Mike Fulmer: Was raised a military brat, uprooting often, world travelers ... not much time for toys or play which, perhaps, is the reason I play so much now. TTR: How did you become involved with Lionel? Were you hired to create specific projects or to develop your own ideas for the company? Mike Fulmer: That's an often-asked question. My link with Lionel, and other adventures, can be attributed to "perpetual motion." Just one more bus-stop along a very busy highway. I never had a master-plan or an ambitious affliction. I either fell into it, or it fell on me, just let the road took me where it wanted me to go... the Marine Corps ... welding pipe from Alaska to the Red Sea ... building and blowing a lot of A/Fuel dragsters in Bakersfield. I'm by-passing many other small events that, collectively, opened other doors. Lucasfilm relocated from L.A. to San Rafael in '79 to begin The Empire Strikes Back. Once again, via luck, timing or God's grace, I was hired, initially, to set up the Industrial Light & Magic welding shop. The ILM crew was very small then; I was number 24 on the pay-roll. At any rate, the effects director, Richard Edlund, was tired of wrestling with the original, 4-foot, 65-pound Millenium Falcon. He wanted a smaller, 24-inch version. The model was not on the budget and the crew was fairly stretched. I stuck my neck out, promising Edlund a 30-day turnaround. On day-thirty, ILM had a new Falcon and I had twenty-two films ahead of me. Funny thing was that I had never seen the first Star Wars. Almost un-American! Never told anyone until years later; 12-years in fact. Nothing remains the same, however. When the computer took over, I left ILM. To this day, I've never touched a computer. Concept art, drafting, blueprinting and prototyping are done here like they've been done for a thousand-years: by hand. If the power goes down, I keep working. Hasn't failed me yet. After ILM, I spent two years designing the National Model Aviation Museum for the AMA in Muncie, Indiana. Then I returned to Petaluma, California to start a new business, Speedwings. We build everything from street-rods to custom Harley's, high-end scale models to mechanical prototypes, surf-boards to special effects props. If we can't do it, you don't need it that bad. Knowing that, Neil Young called in late '96. Neil is very energetic, effervescent and extremely creative. He wanted to expand Lionel's potential. New concepts and products. New markets, new magic. Neil is very courageous; he faced a lot of internal/external resistance over any change(s) in Lionel's direction. In any case, Neil asked me to prototype his ideas because I was fast, unobstructed and, largely, because I understood his vision. 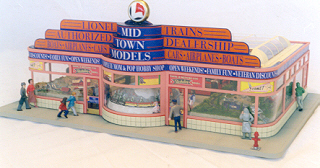 TTR: One accessory that has incredible detail is the Hobby Shop. It also captured that 1950s spirit. How did that project develop? Mike Fulmer: The Hobby Shop, ironically, is the only "independent" idea that I have suggested to Lionel. The concept actually took root a few years back, mid-'93. While designing the AMA Museum, I built a 1950's hobby shop replica, full-scale, as a center-piece, a "time-capsule" where you could look, but couldn't touch. The shop naturally featured all the great kits, accessories and artifacts from that marvelous era. Again, everything in my life has always opened one more door. Hobby Shop prototype. Note the Life-like and Model Power figures. The fire-hydrant is Life-like and the crossing signals are Model Power. On the production models, two large fire-hydrants were used as power terminals to operate the layouts and lights. The production model didn't have figures on the sidewalk. If you look above each fire hydrant, you will see the logo for Mike's company Speedwings. TTR: What can you tell us about some of your other ideas developed for Lionel? If I remember right you designed the Back Shop, Route 66 cafes, the Hot Rod deco for a couple of locomotives...how did the products turn out in comparison to your original vision? Mike Fulmer: As mentioned, with exception of the Hobby Shop, I received all marching orders from Neil and/or Lionel. To date, I've created thirty-six varied projects/prototypes. They gave me fairly tight "foot-print" and/or mechanical parameters per project, but allowed me a free-hand from concept through fabrication. Again, turnaround time was very quick. Finished blueprints, litho-plates, patterns and painted prototypes were shipped to Lionel and, after approval, shipped directly to the vendor(s) in China. Now, comparing any prototype against the finished product can make some artists quite ill. I have always known, however, that all forms of originality have always been compromised. Lionel is not unique in this regard. The world has never been short of marketing guru's, bean-counters and arm-chair quarterbacks. I refer to these natural obstacles as "creative interdictions." A good example can be leveled at the infamous Back Shop. The original design/prototype was incredible. By the time this piece reached the customer, it was not the nearly the same product. The downside, of course, is that the rifle barrel is usually pointed in the artists direction. Builds character. 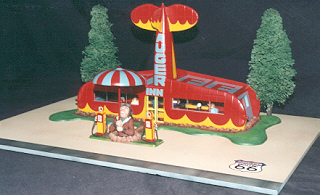 The "Auger Inn Cafe" model was never put into production. By the way, the Route-66 series (most never produced) was not introduced to the primary market. They were, in fact, designed to enter the 1/48 scale auto market. Hundreds of beautiful scale autos with no place to park them or give them "scale." Too bad because to this day, that group of collectors don't even know these pieces exist. On Lionel's behalf, they have a new captain and crew. People like Paul Condelis are doing a super job with all their new projects and products. 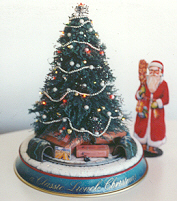 The first animated Christmas tree display with the Blue Comet has become very collectible. TTR: Toy trains are obviously more whimsical than accurate models, but since the 1990s this hobby has shifted to more scale, realistic trains. Obviously, some realism is compromised when you're dealing with a third rail. As a model maker, do you find such compromises frustrating? Does it depend on the project? For example, model trains are fun and toys, so it's okay to sacrifice a certain amount of realistic detail. Mike Fulmer: Toy designing is compromise, every step of the process. 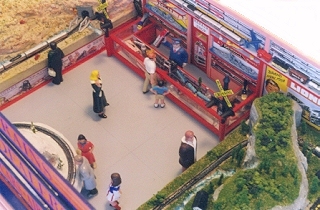 There are only two types of model trains: toys or fine art. You play with one and you polish the other. Doesn't make a whole bunch of difference to me, as long as the check clears. TTR: I'd like to talk a bit about films. In some cases, models have to be accurate miniatures of things like buildings and other structures. In others, like Star Wars, models of ships are made and are based on the imagination. How detailed do models based on reality have to be for film? Mike Fulmer: Models for film, whether based on fantasy or reality, are usually "maxed-out." Your eye sees everything. I say this based upon the past. But everything changes. At some point, the computer will allow the technician to place my head on Madonna's body. I can't wait to see that. TTR: Are building models of space ships in a fantasy setting like Star Wars more difficult than reality-based designs? It seems like on one-hand, whose to say any part of it is incorrect? But on the other, in many cases, a 3D representation of certain space ships has almost no precedence. Isn't it awfully tempting to cheat on a detail that no one (in the audience) would notice in order to get something done on-time? Mike Fulmer: Yes, speed in filmmaking is critical. That's why they hire most of the people you see at the end-credits. Effects modelers must be an engineer, a painter, a machinist, a mold-maker, a pattern-maker, a draftsman, and, on occasion, even a plumber. Your entire focus revolves around detail, speed and mechanical function, 12-14 hours a day, often 7-days a week...for years. Sounds exciting, doesn't it? What can you tell us about those days? Mike Fulmer: For me, the first five or six years at ILM were fast, furious and a hellofa lot of fun. A roller-coaster ride. Big, wild parties in San Francisco. Faces and places I can't remember. But, things change. The company grew tremendously. The tight, often rebellious "family" gave way to corporate America; rules, regulations and redundant deodorant meetings. Not their fault; I just couldn't breathe anymore. TTR: What are some of your proudest accomplishments in your career? Mike Fulmer: Wow. Another loaded question. I've done so many things in my life that trying to pick a single "bright" spot is difficult. Yet, I can remember the first screening of Empire. The whole crew was there, naturally. George Lucas gave a quick talk, thanking us all for the maximum effort. As the lights went down, the 20th Century-Fox drum-roll began. And I honestly started to cry. For the-first time in my life, I had used everything I had, everything I'd been given, everything I'd ever learned... in one place, at one special time. Nothing would ever be the same. Which is really what we all really want, isn't it? 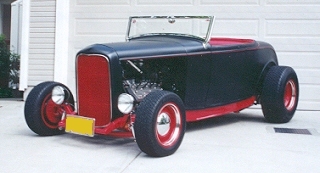 This roadster is one of the larger models Mike has worked on. TTR: You mentioned earlier how being a modeler means you have to know a lot of different trades. As a professional, what advice do you have for other model makers or those who are interested in the craft? Mike Fulmer: Advice. Well, to begin with, there are many miles between modeling as a hobby and modeling professionally. As a hobbyist, one can afford the luxury of time, subject matter and personal environment. These factors disappear if you go professional. Someone may ask you to build a 20-foot, fiberglass cucumber in 24-hours. This may not provoke much excitement, unless you're into static vegetables. I do very well with all that because of my life experience. I have no special gift or talent. The world is full of talented folks, most don't even know their own limitations...that's probably the chief reason I'm still in business. Learn all you can. Look around. Study everything. Once, I asked my father why he was so smart. He simply said, "You hang around smart people, son." That didn't happen soon enough for me. Someday, maybe I'll write a book about all this. Think I'll call it "Special Defects." Star Wars and The Empire Strikes Back are registered trademarks of Lucasfilm, Ltd.